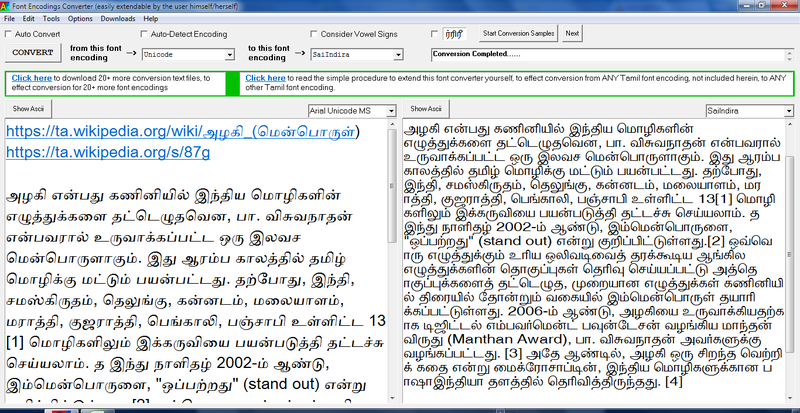 A "first of its kind" and extraordinary Tamil fonts converter. Among other exquisite features, Azhagi's converter can do conversion of formatted text too - directly inside 'MS Word' documents itself - thereby retaining all formatting - Bold/Italics/Underline, Color, Alignment, Tables, etc. etc. etc. - of all your Tamil text. 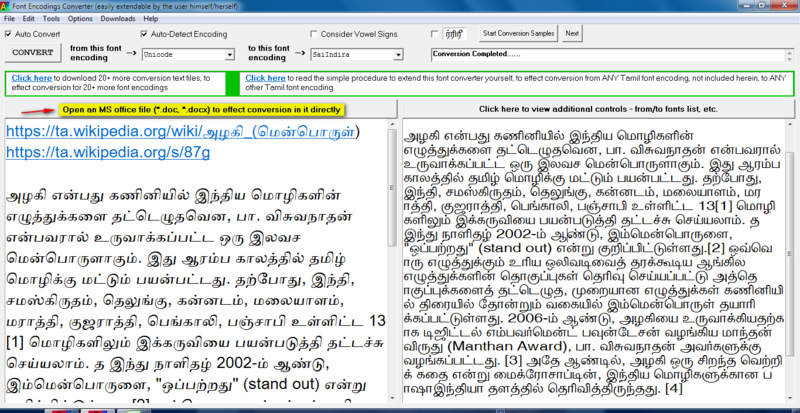 The converter is extendable by the user himself/herself - to convert from ANY Tamil font encoding to ANY other Tamil font encoding. The Tamil font encodings supported by default (as on Jan 2018) are: Unicode, SaiIndira, TamilBible, Tscii, Bamini, TAM, TAB, Vanavil, Shreelipi, STMZH, LT-TM, SunTommy, Amudham, Ka, Diamond, Dci+Tml+Ismail, Gee_Tamil, ELCOT-Madurai, ELCOT-Bilingual, Shree. Thanks a TON to Sri Raguveeradayal for the above videos.